Discovered in the ancient sediments of Alberta, and named for a monstrous hero from ’90s comics, a strange new species of horned dinosaur is an object lesson in how appearances can deceive, paleontologists say. The specimen is a 68-million-year-old skull of a ceratopsid — the type of horn-faced, herbivorous dinosaur whose most famous member is Triceratops. 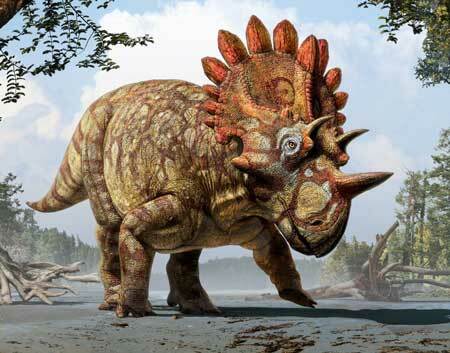 And indeed, the newfound species is a cousin of Triceratops — but it more closely resembles another group of ceratopsids that disappeared hundreds of thousands of years before this specimen lived. “The specimen comes from a geographic region of Alberta where we have not found horned dinosaurs before, so from the onset we knew it was important,” said Dr. Caleb Brown of Alberta’s Royal Tyrrell Museum, in a press statement. The nearly complete, 1.5-meter long skull was itself a striking find, but as the fossil was undergoing the process known as preparation, in which accumulated rock is removed from the fossil bone, the animal’s “bizarre suite of characters” were revealed, Brown said. “Once it was prepared, it was obviously a new species, and an unexpected one at that,” he said. Among its most salient features is the unusual frill that runs along the back of its skull. While some ceratopsids often had modest protrusions along their frilled rims, the newly found specimen sprouted a series of long, five-sided blades, with a giant spike emerging from the center of the skull below. “The combined result looks like a crown,” Brown said. 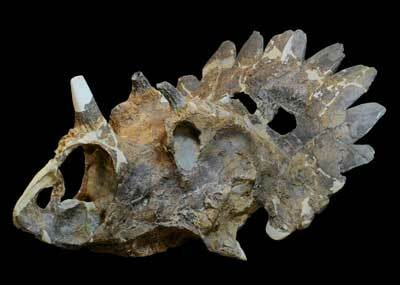 This appearance inspired the rather kingly scientific name Regaliceratops. But some of its other features earned it a less regal nickname: Hellboy. And these features also turned out to reveal that Regaliceratops was not quite what it seemed. Most ceratopsids had distinctive arrangements of facial horns, the paleontologists explained. In fact, they reminded scientists of the comic character Hellboy, a demon brought to Earth who tries to break with his hellish past by filing off his two horns. More importantly, however, the fossil’s unusual arrangement of horns was also evidence of an evolutionary phenomenon that’s never before been seen in horn-faced dinosaurs. “This new species is a chasmosaurine, but it has ornamentation more similar to centrosaurines,” Brown said. Since Regaliceratops lived hundreds of thousands of years after the last known centrosaurines were known to have lived, he added, it must have developed its features separately from the centrosaurines — an instance of what’s known as convergent evolution, when discrete groups of organisms develop the same traits independently. All told, the “Hellboy” fossil shows that there’s much yet left to learn about the history and evolution of horn-faced dinosaurs, Brown noted. 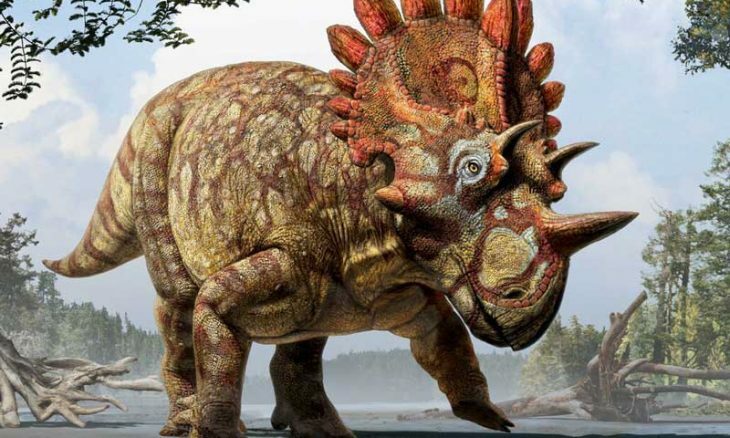 “This discovery also suggests that there are likely more horned dinosaurs out there that we just have not found yet, so we will also be looking for other new species,” Brown said. Brown and his colleagues report their find in the journal Current Biology.